Submitted by Norm Roulet on Sun, 06/18/2006 - 21:05. If folks move to Medina for their health they are fools - today, Medina seems to be the most unhealthy place around NEO, based on particulate levels monitored by NOACA, which as of 7PM on Father's Day is unhealthy everywhere in NEO... real nice present for our kids, eh. I was driving my 6 year old daughter on 490 past ISG and she said it stank and wanted to roll up the windows... and the air the past few days has been oppressive in general. Is ISG just the obvious problem and not a big deal, as we are led to believe... is air pollution a big deal in NEO at all? I don't see big Ozone alerts around town so I assume we're doing great, but on this, I am uninformed. Who really knows the truth, day in and day out, on whether our air is safe or not, and where it is safest? Is it getting better or worse? I'm checking the web to see what I can learn - anyone else know anything about this that they can share? Submitted by Norm Roulet on Mon, 06/19/2006 - 00:18. From Ohio Citizen Action, we learn more about our disgraceful Mittal/ISG mess, and that their environmental representative is none other than "non-profit" Sustainable Cleveland partner attorney David Nash. At least nobody in NEO can be fooled into thinking Sustainable Cleveland is about environmentalism! What a price to pay for some low wage offshore-owned toxic jobs... killing 25% of our population more quickly and horribly with lung and heart disease. That's not sustainable. CLEVELAND -- Cleveland's air ranks among the worst in the nation for pollution from fine, microscopic particles, which can cause lung and heart disease. Mittal Steel put out 403 tons of fine particles per year into Cleveland's air in 2005, according to figures submitted to the Ohio EPA in April 2006. Mittal also reported putting 175 tons of heavier, visible particles (soot) into the air. Over Memorial Day weekend, neighbors of Mittal Steel on Independence Rd. in Cleveland witnessed "black clouds" of pollution coming from the steel mill, and called one of the company's environmental representatives, attorney David Nash, to come and witness the problem himself. Neighbors also experienced metal showers overnight and were kept awake by trucks working throughout the night in the area behind Independence Rd, Sandy Buchanan, Ohio Citizen Action. Submitted by Martha Eakin on Mon, 06/19/2006 - 10:56. One reason we can’t attract new industry, even relatively clean ones, to NEO is that our air quality is already so bad. Since we are already in non-compliance with federal standards(and we won’t even discuss that most of these are too low for “good health”), any industry/business moving in has to meet more stringent air emission standards than they would in an area that meets attainment standards. So by not cleaning up our air, we are prohibiting new businesses from even considering locating here and , across the nation, industries that have bad effects on air quality are heading for the country where the initially good air will allow them to pollute without lowering the overall quality into non-compliance. For example, frequently large auto makers site new plants in rural areas because the clean air there allows their factories higher emission levels without putting them into non-compliance. Unfortunately the ready labor in a city area is more than offset by the high cost of pollution controls. Submitted by Norm Roulet on Mon, 06/19/2006 - 17:11. Awesome, Martha. I've often thought about the economic impact of pollution from the perspective of a dirty environment driving away clean people, but not the impact of pollution on the desirability of a community to both clean and dirty businesses. 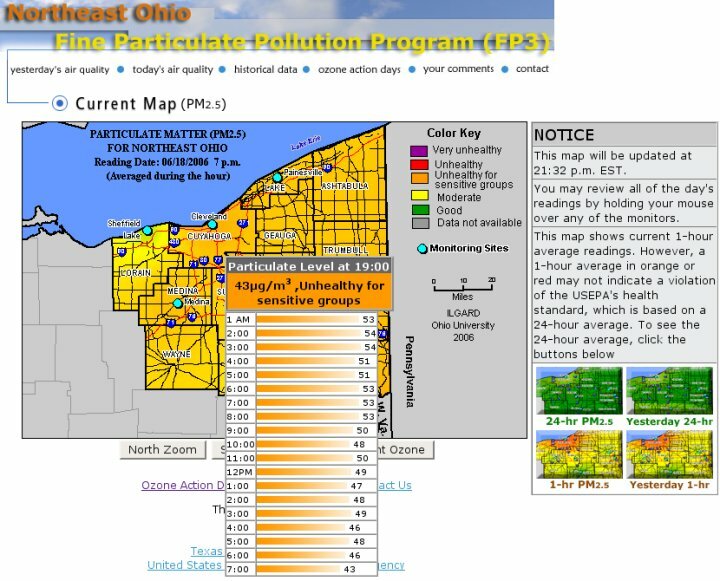 It is especially disturbing to consider that the air pollution data I've looked at on NEO shows the particulate levels yesterday were the worst in Medina, so it seems we've already ruined our inner city and our entire region, even where it seems so green and prime for more industrial growth. This is the type of insight that needs to be front and center in all economic development discussions about this region, and urban cores, along with the impact of pollution on the health of workers (bad air leads to asthema and other health problems that lead to more sick days and higher health insurance costs, not to mention higher more complex claims), and the impact of pollution on the ability of a community to develop a useful workforce at all (lead, for example, diminishes IQ and so lowers the potential of a large segment of the student population, disrupting education for all the students, leading to a far suboptimal workforce across the board). Submitted by Norm Roulet on Mon, 06/19/2006 - 00:33. Submitted by Norm Roulet on Mon, 06/19/2006 - 00:37. 16 JUNE, GENEVA, SWITZERLAND -- "As much as 24% of global disease is caused by environmental exposures which can be averted. Well-targeted interventions can prevent much of this environmental risk, the World Health Organization demonstrates in a report issued today. The report further estimates that more than 33% of disease in children under the age of 5 is caused by environmental exposures. Preventing environmental risk could save as many as four million lives a year, mostly in developing countries. The report, Preventing disease through healthy environments - towards an estimate of the environmental burden of disease, is the most comprehensive and systematic study yet undertaken on how preventable environmental hazards contribute to a wide range of diseases and injuries," press release, World Health Organization. Submitted by Norm Roulet on Mon, 06/19/2006 - 23:45. Good air so far today... was it the rain? Submitted by Norm Roulet on Tue, 06/20/2006 - 07:29. I'm trying to understand this air pollution thing - it rained like crazy yesterday and that seems to clear the air - this morning the ozone maps read "good" - can we perdict how it will be later today? Is the pollution level related to rain, and does that mean all that pollution is now in Lake Erie? Any experts in this out there? HOW MUCH BLAME DO THE FOLLOWING DESERVE FOR THE PROBLEMS FACING THIS COUNTRY'S PUBLIC SCHOOLS? The Waterloo Cafe (Now Open) - Head on down to the 'Loo! GANG STALKING.. A WORLWIDE PROBLEM.